Figure 1: One µg of unmethylated (Un), 5-methylcytosine (mC) or 5-hydroxymethylcytosine (hmC) Methylated DNA Standard (Catalog No. 55008) was incubated in the absence or presence of 1 unit PvuRts1 I enzyme for 30 minutes at 22°C. 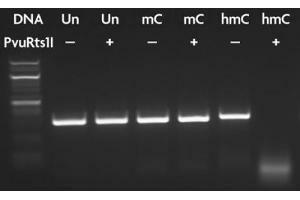 Each reaction was run on a 2.5% agarose gel alongside a 1 kb DNA ladder. Specificity PvuRts1 I restriction enzyme recognizes the sequence hmCN11-12/N9-10G. Application Notes PvuRts1 I restriction enzyme can be used to directly cleave hydroxymethylated DNA in its non-glucosylated form. The PvuRts1 I enzyme also digests α and β-glucosylated hydroxymethylcytosine DNA, but at a lower efficiency than the non-glucosylated form. The enzyme is specific to 5-hmC DNA and will not digest 5-methylcytosine residues or unmethylated DNA. The enzyme is best suited for use in regions of high 5-hmC density, such as gene bodies. One unit is defined as the amount of enzyme required to fully cleave 1 µg of 5-hmC DNA Standard (ABIN2866136) in 30 minutes at 22°C in a total reaction volume of 30 µl. A pilot titration of enzyme is recommended for cleavage of genomic DNA. Storage Comment The PvuRts1 I enzyme is supplied in 50% glycerol and can be stored at -20°C. Make small aliquots and store at -80°C for prolonged storage.